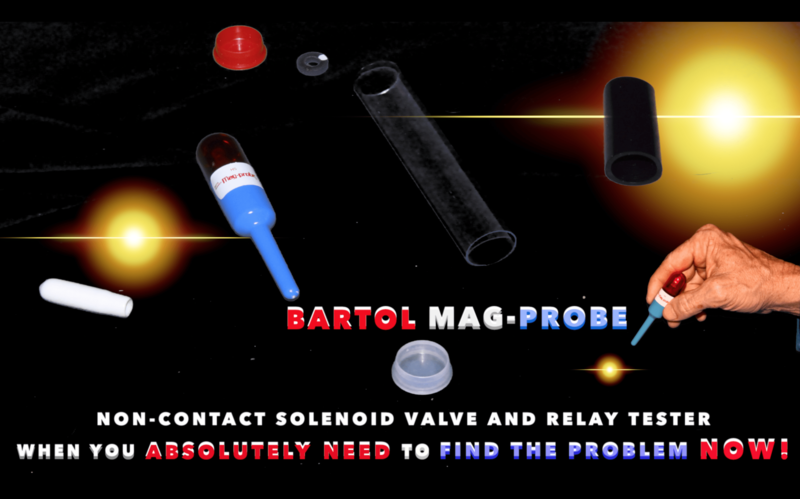 Kevin Gittemeier’s YouTube Video Shows the Value of the Bartol Mag-Probe which is an Intrinsically Safe Underwater Tested Non-Contact Solenoid Valve and Relay Tool that can be Used in Explosive Environments . Solenoid valve testers that operate using interchangeable batteries are not intrinsically safe and are at risk of corroding internal contact points rendering them useless when testing solenoid valves and relays underwater. The Bartol Mag-Probe is a completely self contained test instrument allowing flexibility for use in conditions where interchangeable battery operated testers have a high failure rate. If you have ever used a flashlight with interchangeable batteries I’m sure you remember pounding on the flashlight to get it to work. This will never happen with the Mag-Probe because every connection is soldered and totally sealed, isolating the internal components. This allows use in liquid, explosive or corrosive environment making it an intrinsically safe tool for technicians testing solenoid valves or relays on off shore oil rigs, natural gas operations, refineries or chemical processing plants.